To calculate the sum of the amounts sufficient to add all the components that are included in a separate sum. 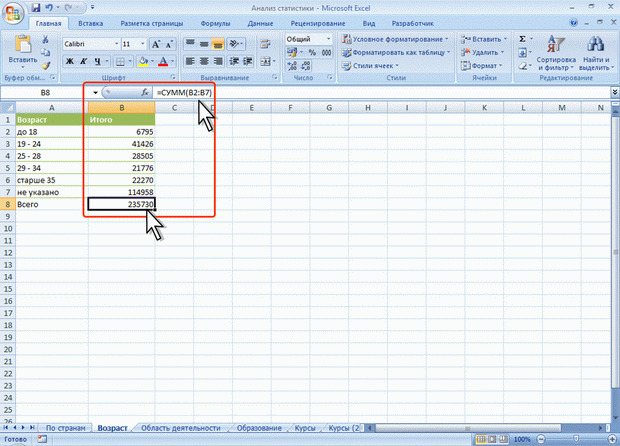 If calculations are performed in Excel to calculate the sum of the amounts can be much faster and easier. To in Excel to calculate the sum of the column sums of the table, place the cursor to the right of the rightmost column in the row where the column totals. Click on the sum sign "? ", located under the main menu called "AutoSum". Depending on preferences and previous actions the program will highlight the block of cells that (in her opinion) you intend to summarize. If the selected block is not aligned with the row of partial sums, then select the line (to a selected cell) and hit “Enter”. Then in the highlighted cell will show the formula for the calculation of the sum of the column sums, and also evaluates its value. To in Excel to find the sum of the sums of the rows of the table do the same. Position the cursor below the bottom-most row in the column where are the amounts of rows. Click AutoSum (?). Select the block of cells you want to sum (in this case it will be part of the column to the final cell). Press “Enter”. Then in the selected cell will be the formula for the calculation of the sum of the line amounts, and also evaluates its current value. If the partial sums are located on different sheets in the table, calculate the sum of the amounts of the easiest way as follows. Add to the table a new worksheet (it will be the formula for calculating the amount of the sums). To do this, select in the main menu "Insert" - "Page." Click on the sheet in any cell, place the cursor to it and press the sum sign "?". Now, moving from leaf to leaf, alternately point cells with partial sums. After each "note" you need to click the semicolon (;), and in the end press "Enter". The resulting formula will collect all pre-sum from all sheets in the table and will sum them.